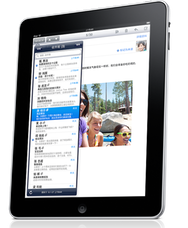 Apple announced on Monday that it will be releasing the Wi-Fi models of the iPad in China on Friday, September 17. The iPads will be available from Apple Stores and selected Apple Authorized Resellers in the country, starting at 10:00 a.m. local time. Prices will start at CNY3988 ($589) for the 16GB model, CNY4788 ($708) for 32GB model, and CNY5588 ($826) for 64GB of storage. Apple Stores will offer a Personal Setup service as well as hold iPad workshops to help buyers get familiarized with the device. There is no word, however, as to when the Wi-Fi + 3G models will arrive in the planet’s most populous nation. It seems that, at least for the moment, Apple hasn’t yet reached a deal with any of the local carriers, even though it already has a deal with China Unicom to distribute and sell iPhones. Apple also announced that the iPad is coming to more countries by the end of the year, though it didn’t specify exactly which ones.